Desserts tell a story - they can take the person eating them on a sensory journey from the first look to the last bite. In I'm Just Here for Dessert, Caroline Khoo of the highly successful dessert business Nectar and Stone, blends her talent for creating simple yet delicious desserts with her love of beauty and sophistication to provide the reader with the skills and tools needed to shape their own personal style of dessert design. Caroline believes that everybody eats with their eyes first so how you style your food and which props you use to set the scene are an integral part of making food and drinks look amazing. In the first part of the book, Caroline talks through the importance of understanding, learning and mastering the basics when it comes to baking and decorating, including harnessing your inspiration and style to create something gorgeous. And because sharing images of her work has been such a huge part of Caroline's success (she has over 364,000 followers on Instagram), Caroline includes her top tips for styling, capturing and sharing your own triumphs on social media.In the second half of the book, Caroline presents basic recipes to shape the foundations of your business, as well as some flavour combinations that will have you itching to get baking in the kitchen. Learn to make two-tone meringues and Cotton candy cupcakes; Ombre iced donuts and Caramel macarons with pink salt; Salted caramel and dark chocolate tart and Spiced apple waffles; and a Lemon and coconut dream statement cake. There are even cocktail ideas (think Lychee squeeze and Pink tequila). 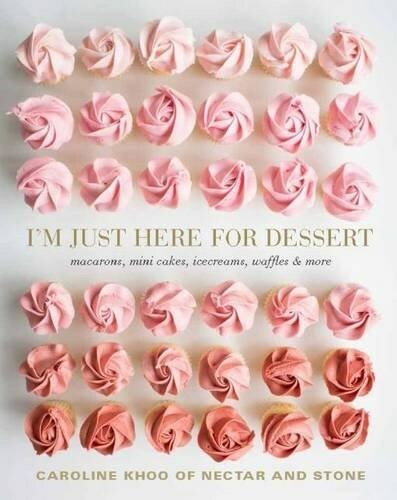 Along with piping, icing and decorating techniques and advice on flower styling and concept design, I'm Just Here for Dessert is a must-have book for any dessert lover who's looking to turn their hobby into a full-time occupation.